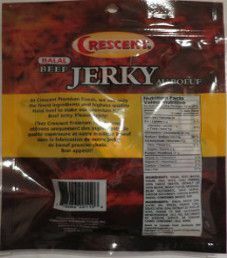 Crescent beef jerky is distributed by Crescent Premium Foods Inc. based out of Toronto, Ontario, Canada. Crescent Premium Foods Inc. aims to provide Muslim consumers with top quality Halal products. I know that this jerky is made by a different manufacturer, I don’t know the name yet. That would make this jerky a stock recipe. The liquid for the marinade is comprised of water and a not so healthy soy sauce. 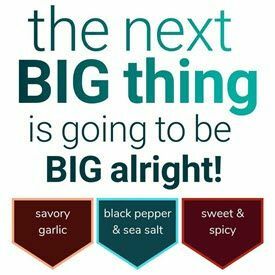 The spiciness of this sweet and hot flavor comes from the crushed red chili peppers, which are healthy if eaten in moderation. The super healthy garlic is listed as an ingredient. The sugar level is very respectable at only 2 grams of sugar per 28 grams of jerky. On the other hand, the salt level is extremely high at 530mg of salt per 28 grams of jerky. The preference is 350mg of salt or under. Apart from salt, the preservatives are unhealthy sodium nitrite, and the more healthy sodium ascorbate, which is salt mixed with Vitamin C. Unfortunately, the unhealthy food enhancer MSG is used. These slices are thin, with medium to small size pieces. It’s a fairly dry jerky but still easy to chew. No wads of meat that are not chewable, and no signs of fat are visible. The crushed red chili peppers are visible. First of all you notice the sweet sugar taste. There is a slight spiciness to this flavor, which increases the more you consume, nothing overly hot though. The beef flavor is fairly weak, as is the soy sauce taste. I can’t say that I detect any smoke flavor. This jerky is kind of salty, but not more so than your average bag of jerky. Can’t say that I detect any garlic flavor. 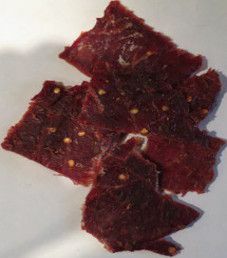 The jerky slices itself have a pinkish appearance, which tells me a fair amount of sodium nitrite was used. Overall, a nice taste, where 72 grams was not enough. This 2.5 ounce/72 gram bag cost $4.99, which works out to $1.99 an ounce. That equates to an average price. Not a bad choice, but there are better deals out there. This is certainly a professional looking bag. The design is interesting, which has multiple colors immersed together. The Crescent logo is clever, with the ‘C’ displayed as a quarter moon. Being a product from Canada, there are French translations for everything. As a Halal meat product, there is an official stamp designating “Slaughtered by a Muslim in accordance with Islamic Rites”. There are no slogans printed on this bag. 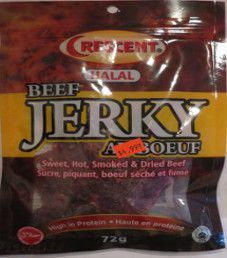 A few facts are printed such as “Sweet, Hot, Smoked & Dried Beef”, “Halal”, and “High in Protein”. Most bag categories are covered. Missing is the weight also stated in ounces, plus there is no best before date. The bag has a blurb about Crescent Premium Foods Inc., which is appreciated.